We’re at the halfway mark of the NBA season and the Wizards currently stand at an impressive 28-13 record and second overall in the eastern conference. Even as an optimistic Wizards fan throughout the years, this team has exceeded my expectations so far. Maybe it was the impressive 13 point win against the newly reconfigured Cavs team? Or the emergence of John Wall as a superstar and legitimate top 5 MVP Candidate? Or how about more recently where the Wizards beat the Spurs and Bulls on back to back nights when analysts were screaming “this team doesn’t have quality wins”? We can all agree that the Wizards are playing extremely well as they are off to their best start since 1975-1976 and have cemented themselves in the second tier of the eastern conference (Atlanta is in it’s own tier). This team is exciting, fun to watch, and can beat anyone on a given night. Here’s where they need to improve if they want to become elite. Turnovers – This is becoming more of a problem as of late. Right now, the Wizards rank 17th in the league committing 14.7 turnovers per game. This isn’t disastrous as there are teams who commit more turnovers than the Wiz and have better records (Golden State, Houston) but this is not a winning recipe. Both Golden State and Houston play a run and gun, pickup game style of basketball. The Wizards do like to get out in transition whenever possible but don’t take very many shots less than eight seconds into the shot clock. Turnovers mean the team isn’t getting a shot. Not only that, a lot of these turnovers result in easy buckets by the Wizards’ opponents or a player having to take a foul to stop a fast break from occurring. The Wizards have committed 15+ turnovers in the last four of their last five games and nine of the last 13 games overall. The team has gone 8-5 over that 13 game stretch. The Wizards need to be more careful with the ball and it starts with John Wall. As the point guard, John is going to have the most turnovers on the team. He has the ball in his hands the most therefore he’s prone to turn it over the most. The only issue is, turnovers tend to be contagious. Once one player starts throwing lazy or predetermined passes, the rest of the team tends to as well. Turnovers for the most part are a lack of focus; throwing a lazy pass, getting your pocket picked, driving into traffic, etc. Empty possessions are the worst thing for a basketball team. Since this Wizards team doesn’t score 110 points per night, they can’t afford to turn over the basketball 15 times and expect to continue winning. 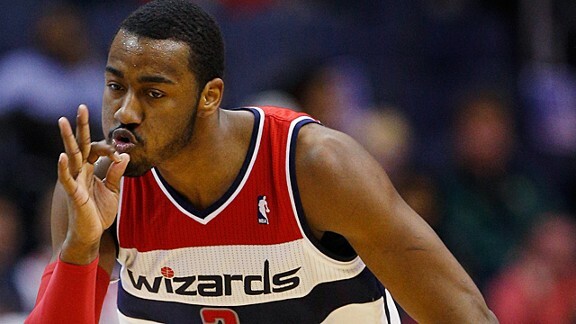 Pick and roll defense – Seems like small and speedy point guards tend to have huge games against the Wizards. Chris Paul, Jeff Teague, Derrick Rose, Aaron Brooks, Eric Bledsoe, Kyle Lowry, the list goes on and on. I know what you’re thinking: “but Alan, those are all elite point guards in the league.” Agree 100%, but there is one area that the Wizards can work on to slow down these quick guards. Their pick and roll defense. The pick and roll is probably the oldest and first play created in basketball. The Wizards have a hard time guarding it and here’s why: Their big men aren’t above average athletically, they don’t hedge hard enough (or at all), and they give the guard too much space if a big man has switched onto him. When a point guard uses a screen on a pick and roll, the defender guarding him tends to go under the screen if the guard is a poor shooter, or will go over the screen and trail the player if he is a good shooter. More often than not, the Wizards, i.e. John Wall goes over the screen when guarding the point guard making the play. It is the big man’s responsibility to either 1. Hedge hard on the guard. 2. Trail the guard until John Wall can recover. Or 3. Switch. The Wizards’ big men seldom hedge on a ball screen and I don’t get why. The hedge is utilized to slow down the player with the ball and it allows the defender to recover onto his assignment above the 3 point arc. Secondly, the big man can opt to trail the guard until John Wall recovers defensively. This is only effective if the weak side defender rotates over to help as well. Lastly, the big man and guard can switch defensive assignments. The Wizards do this way too much and it is extremely frustrating. The guard has a clear advantage over the big man when this occurs. The guard then has two options: drive past the big man or shoot over him. The problem here is that Nene, Gortat, Humphries, and Seraphin are not athletic enough to stay in front of the player. As a result, they will usually give him space forcing him to shoot. If the player is a good shooter, it’s like hitting a shot in pregame warm-ups, swish, simple, no problem. Because there are so many great guards in this league, this often ends up hurting the Wizards. Note: Jarrett Jack going for 26 and 22 on back to back nights against us. It’s not that Jack is a bad player; but when you give an NBA player open shots, he’s going to knock them down eventually. This must change before playoff time as we are going to face a combination of Kyrie Irving, Kyle Lowry, Derrick Rose, and Jeff Teague come playoff time. Consistency – When it boils down to it, consistency is what makes a really good team elite. A team that can show up on any given night and play their game regardless of the opponent. I get it, 82 games is a grind and there are going to be off nights. But the team you are facing should not dictate whether you wake up for a game or not. So far this season, the Wizards for the most part, wake up for the big games but play down to their opponents for some of the “should win” games. Case and point was this past Friday night against Brooklyn. Coming off impressive back-to-back wins over the Spurs and Bulls in as many nights, the Wizards sleepwalked their way through the Brooklyn game. Might I add, Brooklyn was without starting point guard Deron Williams and was on a seven game losing streak. To lose is one thing; to get beat by 22 on your home court is another. Losing by 22 to a team that was seven games under .500 due to lethargy and poor effort is unacceptable for a team vying to win the eastern conference. This wasn’t just a one-time thing either. Take a look at the Heat game where the Wiz won by two but had to squeak by a team playing without Chris Bosh. Granted the team won but even Paul Pierce got in his teammates’ faces saying it was unacceptable. Some other examples include narrow wins over Orlando, Boston, Detroit, and Indiana. On the flip side, the Wiz have no problem waking up for games against the Bulls evidenced by their 2-1 record. Cavs at home? No problem. Clippers at home? No problem. Christmas day game at the Garden; you catch my drift here. Yes it’s tough but if the Wizards want to consider themselves elite, they can’t sleepwalk through games or just not show any effort because they were happy with the victory from two nights ago. In all, the Wizards are a very good team with the potential to make a deep run in the playoffs. This team has dodged major injuries (knock on wood) to this point and it seems like these guys really like playing along side one another. It’s crazy just how far this team has come in one short year (we were 20-21 and the midway point last year). If the Wizards can improve on these three items, they will cement themselves as an elite basketball team; not just in the east.